Spray 30 mini muffin cups with cooking spray. In large microwavable bowl, microwave butter and marshmallows uncovered on High about 2 minutes, stirring after each minute, until mixture is smooth. Stir in cereal until evenly coated. Spoon mixture by heaping tablespoonfuls into muffin cups. 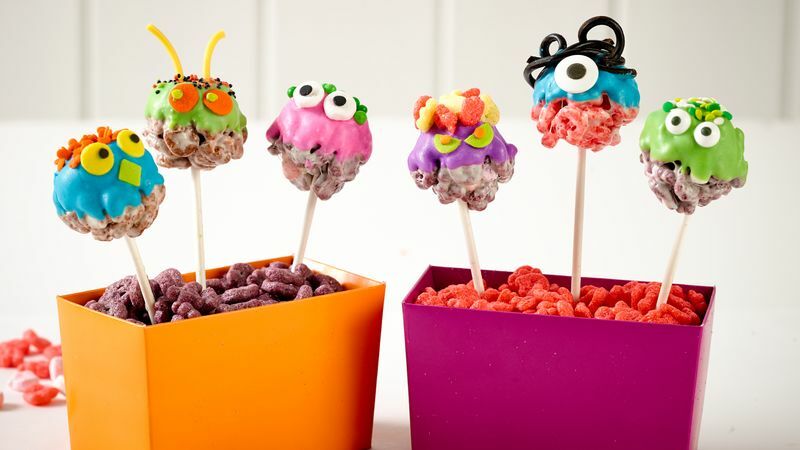 Insert paper lollipop stick into each cup, forming cereal mixture around stick. Refrigerate at least 1 hour or until cereal mixture is completely set. Carefully remove pops from muffin cups. Dip and decorate half of the pops at a time: In 1-quart microwavable bowl, microwave 12 oz of the candy coating uncovered on High 1 minute 30 seconds; stir. Continue microwaving and stirring in 15-second increments until melted; stir until smooth. Color melted candy coating with liquid food color of choice. Dip part of each cereal treat pop into melted candy coating to partially cover with coating. Immediately sprinkle with candy sprinkles. Place on waxed paper-lined cookie sheet. Melt remaining candy coating; color as desired. Dip remaining pops, and sprinkle with candy sprinkles. Allow to set until candy coating is completely hard, about 1 hour. Use remaining candy coating to attach 1 or 2 candy eyes to each pop. Instead of buying candy eyes, consider making them by putting drops of black icing on tops of round candy sprinkles.